Though the Greek and Roman crewmembers of the Argo II have made progress in their many quests, they still seem no closer to defeating the earth mother, Gaea. Her giants have risen-all of them, and they're stronger than ever. They must be stopped before the Feast of Spes, when Gaea plans to have two demigods sacrificed in Athens. 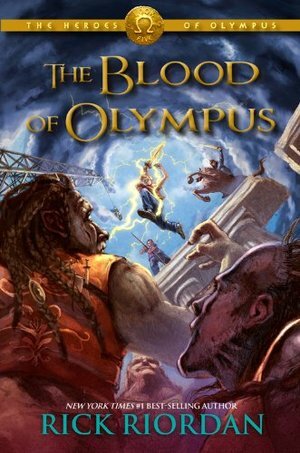 She needs their blood-the blood of Olympus-in order to wake. The demigods are having more frequent visions of a terrible battle at Camp Half-Blood. The Roman legion from Camp Jupiter, led by Octavian, is almost within striking distance. Though it is tempting to take the Athena Parthenos to Athens to use as a secret weapon, the friends know that the huge statue belongs back on Long Island, where it might be able to stop a war between the two camps.The Athena Parthenos will go west; the Argo II will go east. The gods, still suffering from multiple personality disorder, are useless. How can a handful of young demigods hope to persevere against Gaea's army of powerful giants? As dangerous as it is to head to Athens, they have no other option. They have sacrificed too much already. And if Gaea wakes, it is game over. Ugh, no. The series was a disappointment overall. It was disappointing to see that the POVs didn't include Percy and Annabeth. It's not that I necessarily needed them since this isn't "their" series, but it would have been nice to see (unless Riordan intends to explore their world more). It was difficult to continue reading this series with characters that I honestly didn't care about and had trouble keeping them straight on more than one occasion. Overall, it seemed like the author tried to juggle too many characters, too many story lines and too many point of views. I'm almost certain that when I read about the series when it was first announced was that we'd get a new hero: Jason and that this would be "his" series, like Percy had his. I respect and can appreciate wanting to bring in more POVs, adding a diverse cast and having that cast have a say, etc. But this was definitely a case where it didn't serve the story and/or Riordan simply didn't have the talent to write them all/room to expand since these books are...middle grade/YA, it was simply WAY too much story for 5 books. There's not much to say. I pushed through it even though it was not a series I ended up enjoying. As I said with some of the other previous books it's really shocking how well-rated these books are. Normally I feel I can trust the general rating as a guide but this seems way off. It's a pity, because there was a great tale here but it just got lost under too many threads. Would recommend the entire series as a borrow unless you find you really did enjoy them. I loved this, however I was expecting more at the end. For all the build of through the series is was just like here is the climax... And it's over. It just wasn't as big as I thought it would be.